Are you prepared in case a medical emergency happens? Would you know what to do if you or a friend broke a bone during a hike through the woods? Boost your resume and learn life saving skills by enrolling in first aid and CPR training in Nova Scotia with Halifax First Aid. This provider offers experienced teachers, low prices and a conveniently located training centre in the heart of Halifax. Participants can register for a wide range of courses including standard, emergency, babysitting and childcare first aid. Private courses are also available with competitive rates for groups and / or companies. Safety training and food safe classes are also available for participants looking to build their resume. Enrolment is really easy! Just visit the Halifax First Aid website here, choose a training course, and fill out the application form. You can also register for a course using the contact information posted below. Staff are available from 7 am to 6 pm to help with registration or to answer your questions. 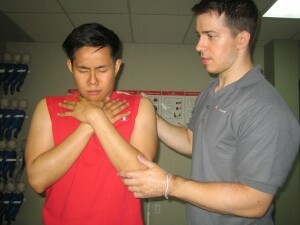 First Aid classes will teach students how to handle choking emergencies. Why Choose Halifax First Aid? Halifax First Aid offers the largest selection of training courses in Nova Scotia. This provider offers the lowest prices on courses in Nova Scotia. Trainees who drop out are given full refunds, provided a 72-hour notice was given beforehand. All classes are taught by workplace approved certified instructors and certification provided meet workplace and academic requirements for 3 years. All classes are held in high-end training centers with spacious and well-maintained classrooms. Private classes are available at the Halifax First Aid training centre or at your facility (if space allows). The training facilities are easily accessible by public and private transportation and are within walking distance to free parking, restaurants, and shops. Enrolment may also be completed using a telephone call, e-mail, or walk-in at the training center. First aid classes cover a variety of emergency situations and the associated first aid skills with each. Training classes include a lot of skill training, usually on training mannequins or fellow trainees so students are able to recognize life threatening emergencies and act appropriately. What Courses Are Available With Halifax First Aid? To register or for inquiries about any of the above courses use the contact information posted above. Head to Halifax First Aid now to sign up with the best workplace approved first aid and CPR provider.